GeForce GTX 680 specifications revealed? 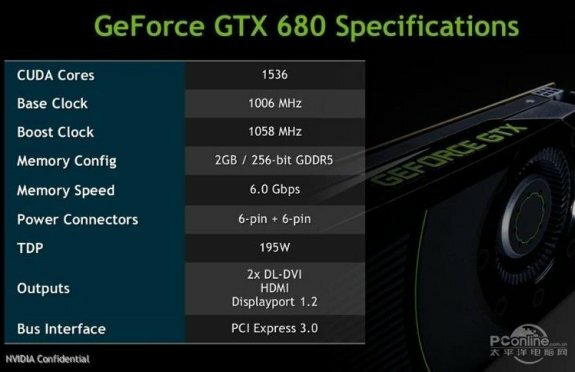 Asian tech site PCOnline.com.cn leaked a slide of what is claimed to be the specifications of NVIDIA's GeForce GTX 680 graphics card. The slide confirms the chip has 1536 CUDA cores and reveals a base core clockspeed of 1006MHz, a "boost" core clockspeed of 1058MHz, a 256-bit memory bus, and 2GB GDDR5 clocked at 6000MHz. It also reveals that the card has two 6-pin connectors and a TDP of 195W. Display outputs include 2x DL-DVI, HDMI and DisplayPort 1.2.